Great memories are created from great traditions. That's what we strive for during the holidays....Great Memories! Every great memory has a great theme song. The music played in the background, that sets the atmosphere. 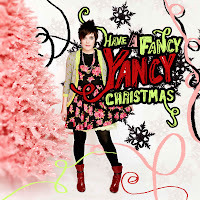 Our theme song for this Christmas is "A Fancy Yancy Christmas". This new Christmas album is a mixture of traditional Christmas carols and contemporary favorites, all performed in a fun way. You can check out the album at Itunes or Amazon.com, and of course Yancy's website. Let this Christmas be the year you start some new traditions and let Yancy be this years theme song. Merry Christmas!